On Sunday, the United States will take the field against Portugal in Manaus, where, despite a dramatic victory over Ghana and Portugal's feeble showing against Germany, the Yanks will find themselves as slight underdogs. But the gulf between the two sides is much narrower than when they met 12 years ago in group play at the 2002 World Cup. Back then, the Americans weren't just underdogs; they were afterthoughts. Stacked with world-class talent, Portugal's Golden Generation had reached the semifinals of Euro 2000. The U.S., meanwhile, hadn't earned a single point in a dismal showing at France '98, a campaign marked by a crisis of leadership and riddled with dissension. Most didn't give the Stars and Stripes a chance against one of the pre-tournament favorites. In many ways, the parallels between the 2002 and 2014 fixtures are uncanny. Just like today's team, Portugal's Seleção in 2002 featured a transcendent star in Luís Figo. The Americans, meanwhile, were comprised of a scrappy core of domestic-based players, a handful of remarkably young upstarts, a select few who were succeeding in Europe, and a hard-as-nails striker with ties to Fulham FC. Coming off his best season in the Bundesliga, American defender Tony Sanneh was brimming with confidence prior to the opening game. So, too, was midfielder John O'Brien, who was in great form after finishing his year with Ajax. For O'Brien, the tone was set by U.S. coach Bruce Arena in preparation for South Korea/Japan. "Bruce wanted us to be the fittest side at the tournament, so we all got behind that and we trained hard," he says. Moreover, when the team gathered for film sessions to analyze some of their opponent's weaknesses, there was a growing sense of opportunity, knowing full well that they'd be entering the match under the radar. Upon arriving at the stadium in Suwon, South Korea, O'Brien went through the standard pre-match routine, though his nerves were heightened. All that changed once the teams met in the tunnel. The surreal haze dissipated, and he vividly remembers feeling the experience come to life. Standing side-by-side with the Portuguese starting 11, it felt as though Luís Figo, a former World Player of the Year, was more of a "caricature or an action hero than a real person." But seeing the colors, and hearing the murmur of the crowd, everything came into focus. "Suddenly this was a much bigger thing," O'Brien says. "This was the World Cup, where every game is written in history." In the game's opening moments, the Portuguese lived up to their billing. O'Brien recalls recognizing that their passes were crisp, their touches seemed clean and their runs were remarkably fast. But on a corner kick in the game's fourth minute, the U.S. midfielder delivered an early strike that changed the course of the game. "I was being man-marked," O'Brien recalls, his voice quickening. "Ernie Stewart took a good corner in. I remember Brian [McBride] going up for it, and my opponent was ball-watching. I snuck around and drifted away from him. The cross comes in, Brian heads it, the keeper knocks it down, and the ball drops right in front of me." He almost chuckles thinking back on the things running through his mind in that bewildering moment. "Whoa, is this happening?" he recalls. "But then it was, 'Be calm, put it in, strike it well.'" The Ajax man did just that, and as the ball flew past goalkeeper Vitor Baia, rippling the back of the net, the moment seemed surreal. O'Brien heard the crowd erupt as he ran to celebrate with his team. For Sanneh, there was no way to predict such an early goal, but it wasn't a total surprise. As the game wore on, Sanneh recalls goalkeeper Brad Friedel's masterful orchestration and encouragement to push forward without the ball, putting the back line in position to destabilize Portuguese possessions higher up the field. There was a concerted effort to move fast on the break and use the wide spaces. Sanneh, a fullback, would play a vital role in the American attack. "We were one of the fastest, strongest teams in the tournament," Sanneh says, "and Bruce's plan was to attack and pressure every team." With the Americans pressuring 25 yards from Portugal's end line, Portuguese fullback Jorge Costa made a lazy pass. Sanneh anticipated and pounced, and his challenge caromed straight to 20-year-old midfielder Landon Donovan. Donovan's attempted cross then glanced off Costa's back and sailed miraculously past a helpless Baia. 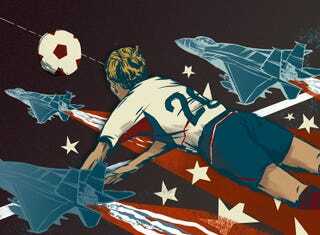 The Yanks were in dreamland, and Portugal was entirely under siege in the 30th minute. At that point, O'Brien says the mentality in the team was "Let's keep going. … Let's keep playing." The mindset paid off. A few minutes later, he moved up the left side of the 18-yard box with a Portuguese defender bearing down. But with the slightest inside-out feint, he evaded the challenge and lifted a service to Ernie Stewart who, with a spectacular scissor-volley, nearly made it three. "That was too easy," O'Brien thought to himself. The team's confidence was building. While many remember Jeff Agoos's ultimately insignificant own goal in the 71st minute, very few (Agoos included) recall his exquisite handling of Fernando Couto's clearance that started what would become the match-winning move. The resulting sequence led to one of the iconic goals in U.S. soccer history. Absorbing another U.S. attack, Couto had no interest in possessing the ball through the back, so he opted to send it high and away. Agoos timed his approach to the clearance perfectly, intercepted Pauleta's touch, controlled with his right, and in one move out of the air, he turned the ball to safety with his left. Connecting with Pablo Mastroeni, who then fed Friedel, the ball quickly found its way to Sanneh on the right. His first entry pass to the midfield was cut out. But Mastroeni had moved into an optimal recovery position, playing the next ball into Donovan's feet. Sensing an opportunity, Sanneh went flying up the wing. A tall man, Sanneh moved with long strides, not so much running as floating above the pitch. Donovan turned with two touches and hit the streaking defender perfectly. The U.S. right back then delivered a flawless cross to the head of a diving Brian McBride, who tucked it past the goalkeeper. English match commentator John Champion exploded, "McBriiide! It's three in 36 minutes! More than that, it's scarcely believable!" But disbelief soon gave way to reality. Agoos vividly recalls feeling "like a band of robbers in a house where the lights just went on." "It was like we woke a sleeping giant," Agoos says of the third goal. With nearly 60 minutes left to play, Luís Figo, Rui Costa, and João Pinto were no longer caricatures or action heroes. They were forces to be reckoned with. Former New York Governor Mario Cuomo used to say that you campaign in poetry, but you govern in prose. If the U.S. won the election in the first 36 minutes, now it was time to get to the work of governance, and the Portuguese were mounting a coup d'état. Beto drew one back in the 41st minute, and the Americans retreated to the locker room with a 3-1 halftime lead. "We needed to hit the reset button," O'Brien says. Asked how the second half took shape compared to the first, he offers a wry chuckle. "It's funny," he says. "I guess I don't remember that as much, because nobody asks me about the second half." But on further reflection, he recalls the conversation on the field shifted to a strategic focus. There had been plenty of time for cheerleading in the first half. For Sanneh, the last 20 minutes were exhausting. Even before conceding the own goal, Agoos says he never felt safe until the final whistle blew. But whatever anxiety the U.S. experienced was matched by an effort and commitment to defending as a group. When the final whistle blew, the team was finally able to exhale and reflect on what would become one of the most famous wins in U.S. history. The players remember the unsung heroes of the day. They point to Mastroeni's tireless effort consistently thwarting Portuguese advances. Sanneh recalls McBride's calming influence over the team and O'Brien's ability to keep playing quality soccer under severe pressure. "We understood the enormity of the challenge," Sanneh says. "And we knew on the bus back to the hotel we were a part of an instant classic." O'Brien says the win against Portugal set a new course for men's soccer in the United States. "The team now expected to get out of our group every time at the World Cup," he says, "and the USMNT was going to mean something on the world stage." Robert Kehoe III (@robertkehoe3) played soccer and studied politics at Wheaton College (IL), and philosophy at Boston College. He lives in Madison, Wis., with his wife and sons.